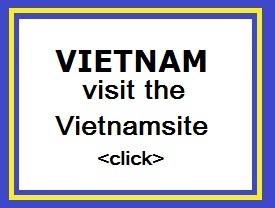 "Paddys bar is a very nice tent with guests between the ages of 18 and 35. Nice to have some drinks and dancing before going to a nightclub. Nice drinks at the happy hour, good dance music (latin, R & B etc), and plenty of room for dancing, there are some dance poles and a stage to perform." Kuta, Legian and Seminyak are one agglomerate. They are stuck together. The boundaries of the municipalities are difficult to distinguish. One street of the municipality turns into the next: with the same name. 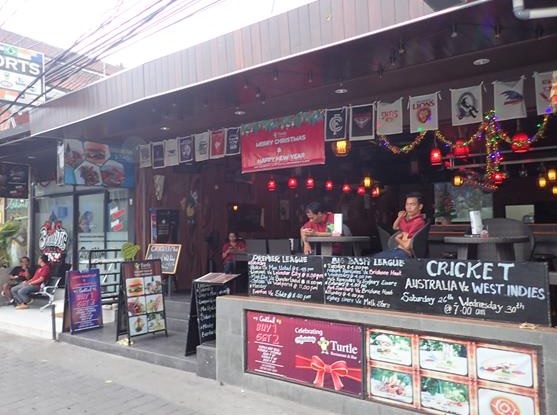 One bar is next to the other, but one of those is in Kuta and the other one in Legian. The bars / nightclub often change name or owner. Sometimes it is renovated and it does not look like the old one anymore. Everything is subject to change! Below are popular bars / nightclubs that have retained their old name. 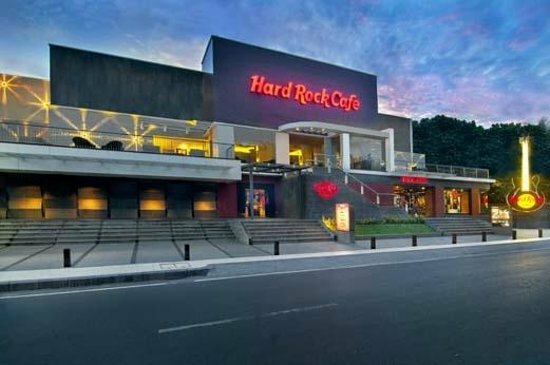 Hard Rock Caf� is located at Jalan Pantai inside the Hard Rock Hotel. It is still one of the best bars in Kuta Bali. Live bands perform live every night of the week. You can order delicious food and drinks at the bar. The Hard Rock Cafe still guarantees good "Rock". 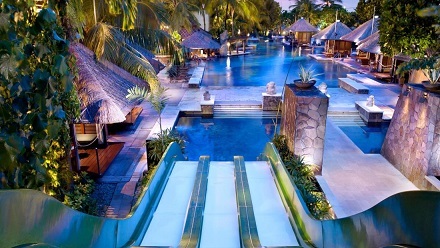 After a long day of shopping or surfing on the waves of Kuta, you can have a cocktail at the Hard Rock Caf�, or enjoy a meal at the swimming pool with your friends. Do not forget to go to the Hard Rock Shop to buy some souvenirs. is, as the name suggests, a popular sports bar at Poppies Lane II. It is the best bar in Kuta to view "live sport". They have a large projection screen on the back wall and 2 large plasma screens above the bar. They usually show Australian sports such as AFL, NRL and Cricket, as well as matches from the English Premiere League. The Sports Bar is also a great place to look at the people who are passing by. If you have a table in front of the Sports Bar, you can look at the people in the street and the beautiful cars and motorbikes riding through Poppies Lane II. They have also a restaurant with a number of tasty meals, such as hamburgers and spare ribs. The Seven Rooftop Bar is located on the roof of the Kutabex Hotel at Jalan Pantai directly opposite the beach of Kuta, at the corner of Poppies Lane I. The Seven Rooftop Bar is a good place to watch the sunset. there is live music from 7 pm in the evening and a DJ who plays "cool" music at other times. There is a billiard table, wifi and a swimming pool. With a nice beer or cocktail during "happy hour" it is the best way to relax and to enjoy the sunset. The VH Bali - Velvet Hypnotized is located on the roof of the Beach Walk Shopping Center (3rd floor). 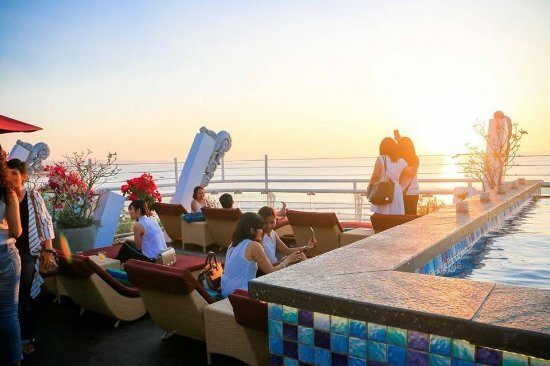 The VH Bali - Velvet Hypnotized is the number 1 spot to view the sunset over Kuta. Make sure you are early, so you have one of the coolest places with the best view. The fresh fruit juices are delicious. The menu is focused on Western cuisine, but the prices are on the high side. Drinking and eating is good. Nice place to enjoy the drinks and the view. Paddy's Pub is a nightclub that flanks next to Bounty Nightclub on Jalan Legian. It is the third edition of the legendary Paddy's Club. It has retained much of its former appeal with its fun theme parties and reasonably priced drinks. The pub is open every afternoon from 17:00. You can step straight in from the street. You can choose the open-air terrace to enjoy views of the street with its people. Or go further in to the bar, lounge or dance floor, where mainly young people gather in the early hours. 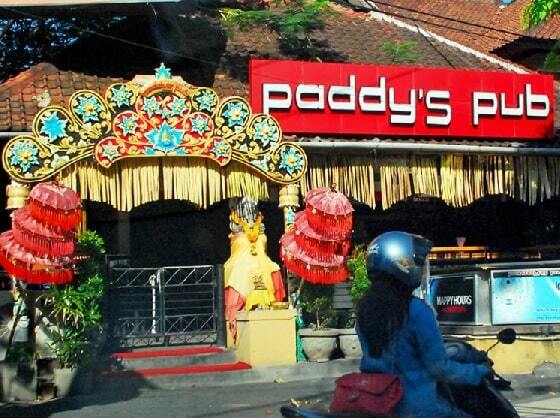 The entrance to Paddy's Pub is a Balinese-style gate with statues and umbrellas. The "temple" buzzes with a combination of colorful laser lights and droning beats. Depending on the theme, you experience a different decor almost every week, so on a night it may not be the same as the previous one. "This is my absolute favorite spot in Bali, the only place I go to watch football on a big screen, the only place I have found Bintang beer from the tap, the cocktails here are fantastic, just like the food."